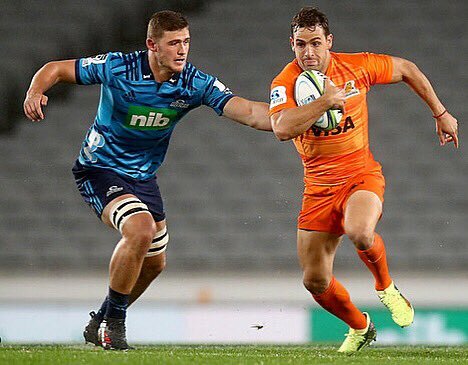 FULL TIME; BLUES 13, JAGUARES 20 - It's all over at Eden Park and the Jaguares have created history as they've chalked up their first win over a NZ opponent away from home. The Jaguares fighting tooth and nail in slippery conditions to upset the Blues in Auckland, walking away with a hard-fought seven point win. That might do it for the Jaguares as Pryor is penalised for not releasing the ball close to the visitors chalk. From close range, Sanchez drives over the three points on offer and stretches the Jaguares lead to seven points with three minutes to run. PENALTY GOAL JAGUARES! (Nicolas Sanchez). 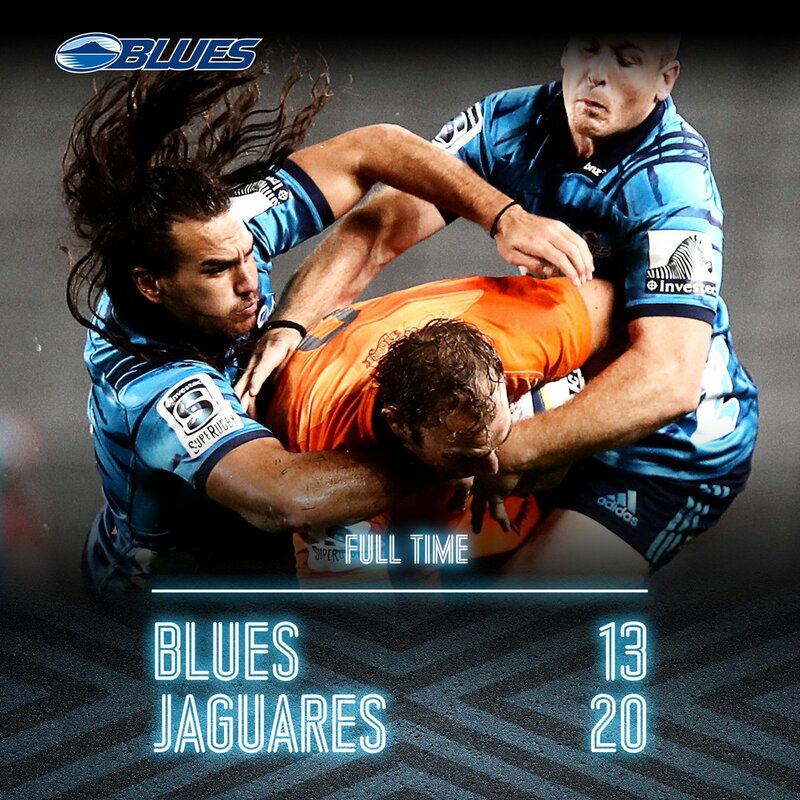 BLUES 13, JAGUARES 20. No issues this time around for Sanchez as he bangs over the extras on offer to extend the Jaguares lead to four points. With only seven minutes left to run, these will be nervy times for the visitors as they try and chalk up their first win over a NZ side away from home. CONVERSION JAGUARES! (Nicolas Sanchez). BLUES 13, JAGUARES 17. Jaguares are making some noise in Auckland as a massive rolling maul sees the visitors with further reasons to rejoice. On the pointy end it Lezana who gets his frame over the line and sends the Jaguares players in raptures. They lead with nine minutes remaining in New Zealand! TRY JAGUARES! (Tomas Lezana). 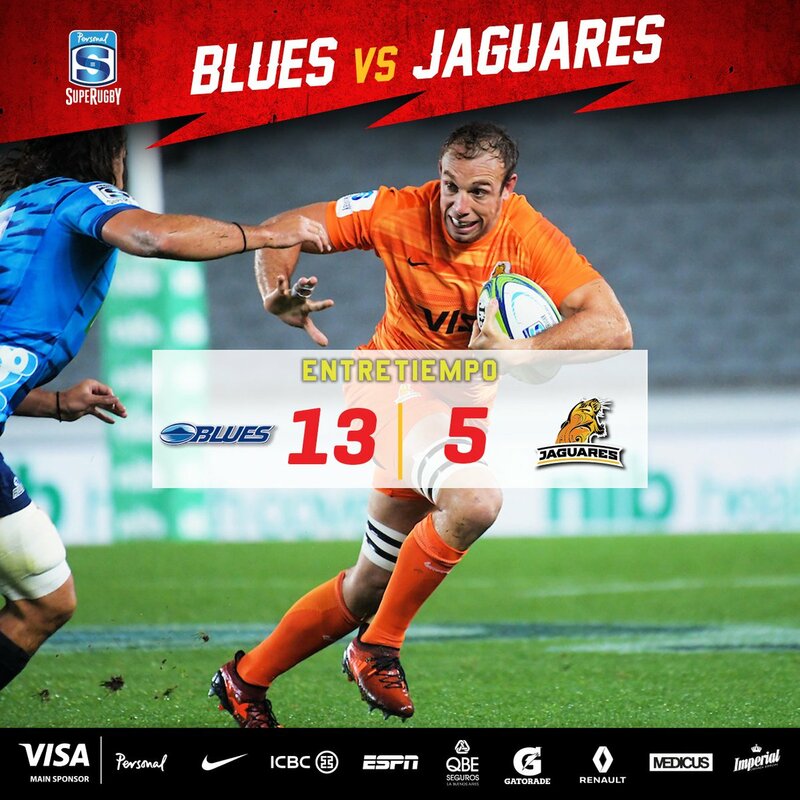 BLUES 13, JAGUARES 15. No joy for Sanchez as his first shot of the night sees him setting up tightly on the left sideline. With rain teeming across him, he hits this one nice enough but again it doesn't have the curl required to find the middle from 20 metres out. CONVERSION MISSED JAGUARES! (Nicolas Sanchez). BLUES 13, JAGUARES 10. Great movement from the visitors as they shift the ball down their left side before the ball finds the speed of Boffelli. With Boffelli pinning his ears back, he races towards the left corner before diving on the ground and letting the slippery conditions do the rest as he glides over. TRY JAGUARES! (Emiliano Boffell). BLUES 13, JAGUARES 10. The Jaguares have conceded the second most tries inside the last 20 minutes of matches this season with 11. Only the Lions and Sunwolves have a worse record with 13 conceded between the 60th - 80th minutes. 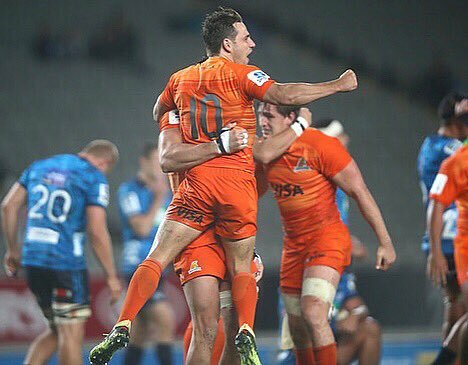 The Jaguares only wins away from home seeing them beat the Cheetahs, Kings, Waratahs, Rebels (twice) and Brumbies. 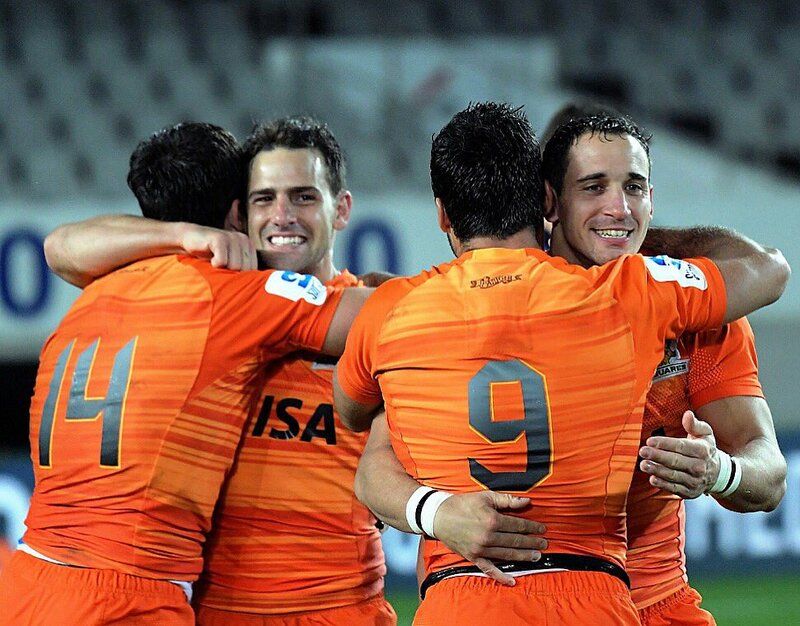 The Jaguares have never beaten a NZ side away from home since their inception. When restricted to just 13 points and when leading at HT at home, the Blues are undefeated on the five occasions this has happened (4w, 1d). The Blues having not lost three in row at home since 2015 when they dropped games to the Hurricanes, Crusaders and Highlanders in succession. The Blues are looking to snap a three game losing streak at home having dropped games against the Chiefs, Sharks and Highlanders in their last outings. On the 23 occasions where the Jaguares have trailed at HT, they have managed to win on 5 of these occasions. Never have they come from behind to beat a NZ based side however. 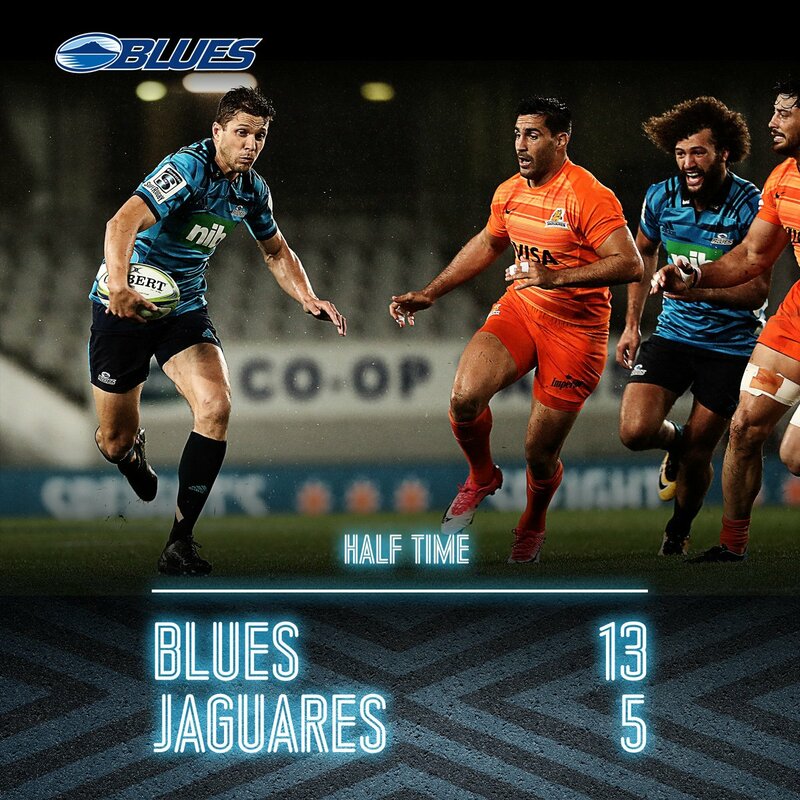 HALF TIME; BLUES 13, JAGUARES 5 - We're done for the first half at Eden Park and in torrential conditions, the Blues have had to scrap this one out with a very positive and willing Jaguares outfit. At the break, there's only eight in this one with the hosts hanging onto a narrow lead. With Creevy sprung for not releasing the ball, it's Perofeta who now has an opportunity to add his first off the boot for the night. From directly in front, and with only 10 metres to work with, the ball is pumped through the middle and extends the Blues lead to eight. PENALTY GOAL BLUES! (Stephen Perofeta). BLUES 13, JAGUARES 5. From one sideline to the next for Perofeta and sadly it's the same result. With this shot from about five metres inside the right sideline, it's carved off the boot nicely but doesn't produce the fade required to fall through the middle. Blues lead it by five in the shadows of the break. CONVERSION MISSED BLUES! (Stephen Perofeta). BLUES 10, JAGUARES 5. The hosts are back in town as the Blues march upfield once again with authority. Setting up in attack 10 metres out, the ball is eventually spun wide, hits the ground and is scooped up by Duffie who throws a dummy in order to slide in from three metres out. Played the wet conditions beautifully there. TRY BLUES! (Matt Duffie). BLUES 10, JAGUARES 5. Tough first up opportunity for Perofeta as he needs to set up basically hemmed in on the left sideline. Struck with confidence and conviction, the ball shanks towards the right of the posts and narrowly missed drifting in late. All locked up at 5-5 in Auckland and slippery conditions. CONVERSION MISSED BLUES! (Stephen Perofeta). BLUES 5, JAGUARES 5. The hosts hit back almost immediately as they thunder downfield on the back of eight phases. With the Jaguares defensive line scrambling, a terrific looped ball is thrown out to the left side, hits Manu in the chest and sees him able to race in untouched from six metres out. Great vision from Perofeta to throw the cut out ball to be honest. TRY BLUES! (Tumua Manu). BLUES 5, JAGUARES 5. No change to the scoreline as Sanchez can't add the extras from what looked like a pretty easy set shot. With the effort seeing him 20 minutes inside the left sideline, Sanzhez's shot is left fading across the face. Jaguares will welcome the fact they're playing from in front though; they're up by five with a man advantage. MISSED CONVERSION JAGUARES! (Nicolas Sanchez). BLUES 0, JAGUARES 5. And it's the visitors who make the extra man count as they embark on a rolling maul in short proximity to their tryline. With enough momentum built up, it's Creevy who latches onto the end of the caboose to see himself thrust over from eight metres out. First blood to the Argentines in Auckland. TRY JAGUARES! (Augustin Creevy). BLUES 0, JAGUARES 5. With warning already issued across the park, it's no surprise that the next indiscretion would see someone punished. On this occasion, its Ioane who is given a 10 minute spell after he comes under scrutiny for collapsing the scrum. Jaguares with the numerical advantage but can they make it count? YELLOW CARD BLUES! (Akira Ioane). With rain driving down at Eden Park, this game's been punctuated by penalties in pretty dour affair. Referee Williams has already called both captains to answer for their teams with a sin-binning probably not too far away if this continues. Tough going for both sides out there to be honest. 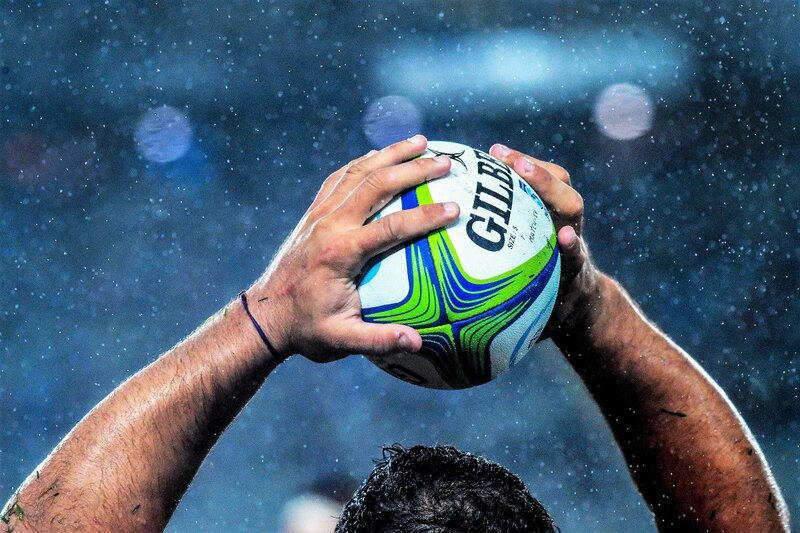 In the opening 20 minutes of Super Rugby matches this season, the Jaguares actually boast stronger figures than the Blues when it comes to five-pointers scored. The visitors having scored eight during this time period compared to the hosts who have a lowly three to their name. Welcome to Eden Park in Auckland for Round 11 Super Rugby action between the Blues and Jaguares..
La satisfacción de el trabajo realizado, de haber podido llevar a cabo el plan de juego. 253 caps for his province and there's time for one more against Leinster today. ¡Mirá las fotos del partido entre Blues y Jaguares, en Auckland! Últimos 2 minutos en el Eden Park, y Jaguares gana por 7 puntos. A mantener el juego lejos del ingoal propio. Otra vez, final para el infarto. @MauriValenti ¡Gracias por el aguante, Tano! ¡3 MÁS de NICO SÁNCHEZ! 20 A 13 A FAVOR DE JAGUARES CON 12 MINUTOS POR JUGAR. Jaguares tiene la pelota y la propuesta del partido. RT @Rbulfon: Q lindoo tryyyyy @JaguaresARG !!!!! ¡TRY de Jaguares que vuelve a ponerse al frente en el tanteador! Emi Boffelli, el tryman del equipo, apoya en la bandera a los 54 minutos. Todo termina en scrum a favor de la defensa luego de trabar el avance del equipo visitante. Line out a favor de Jaguares dentro de las 22 del rival. Otro scrum para Jaguares a 5 del ingoal de Blues. Otro penal para Jaguares con tiempo cumplido.